When I finished Catherine the Great, I wanted nothing more than to move on to a quick page-turning piece of fiction, and now that it's October I'm in the mood for horror. A quick scroll through my To Read shelf on Goodreads reminded me of Slade House, which just happened to be available at the library. It was the perfect choice! The story begins with a boy and his mum, Nathan and Rita Bishop, making their way to a party hosted by a Lady Grayer. They have a hard time finding Slade Alley, but finally they do and eventually locate a small iron door that lets them into the garden of the grand Slade House. They're greeted by Norah and her son Jonah. Nathan stays outside with Jonah, while his mother goes inside with the adults, but things in the yard start turning strange and, terrified, Jonah runs inside and as he goes upstairs he passes a series of portraits and sees that one of them is of him. In exactly the clothes he's wearing today. Things get stranger and stranger, and....well, the Bishops are never seen again. Nine years later, yet another person is lured in, and the cycle continues. I won't say much else about the story, as that's something you should discover for yourself, except to note that there was a witness to the Bishops' disappearance which led to some speculation about what was going on there. But it takes place in the contemporary world so of course people are skeptical about anything supernatural and I kind of love that about stories like this. It makes it all the more realistic and creepy to me. The book was so atmospheric - perfect for a gray fall day - and the characters are well developed so that you really feel for them and don't want a terrible fate to befall them. (It will though. Sorry.) This is a very short book, and each chapter focuses on a different character so I was impressed at how well we got to know each of them. What they experienced was creepy and scary, and they would finally realize what was happening only when it was too late to stop it. It was just what I was looking for. 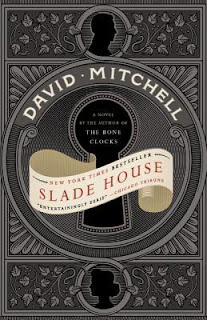 I've read only one other book by David Mitchell - Black Swan Green, which I read way back in 2007 and didn't post about here. I remember liking it a lot, but it was a very different kind of book. I'd definitely read this author again! Do you have any good creepy fall stories to recommend?